We need your vote. 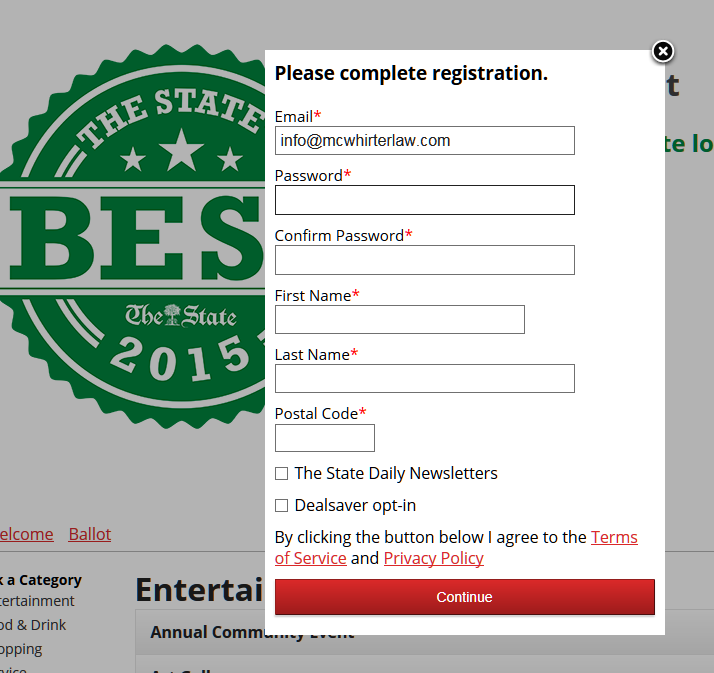 The State newspaper’s The State’s Best contest is going on now. From September 8th until the 15th, The State newspaper is collecting votes for your favorite local businesses. You can vote once per day per email address. You do have to complete a quick registration form in order to vote. According to The State newspaper, you must vote in 30 categories for your vote to count, so pick your 30 favorite businesses and vote away! You can also find The State’s Best logo on The State’s home page at www.thestate.com . Click on Register/Login (this will save you a step later). Complete the registration form if this is your first time logging in. Otherwise, it will just ask you for your password. You will have to complete a registration form for each email address you use, but you only have to do this step once. When you are logged in, click on Service under Pick a Category. We are under two different categories – Attorney & Law Firm. We are the second firm in the category and in red – McWhirter, Bellinger & Associates – Just Click Vote! Remember, we are in two different categories, so please vote for us under Attorney AND Law Firm. Now you can choose your 28 other favorites! Thanks! And remember you can vote once a day per email address!